Ronn Simpson’s footwear really can brighten your day. Inspired by the summers he spent in Mexico, he decided he would sell huaraches, that country’s traditional footwear, which were popularized by the hippies in the 1960s and ’70s. It wasn’t long before his humble setup on the corner of Telegraph and Durant grew into a successful business. So in 1976, Simpson and his wife, Marcela, bought a building on the corner of Telegraph and 43rd, turning Oakland into the permanent home of Brand X Huaraches. While the Telegraph location now serves only as a warehouse and shipment location, Brand X Huaraches continue to be made with the care and quality that Simpson learned from the huaracheros, the original huarache craftsmen in Mexico. Each pair is handwoven in Mexico with a single strand of leather that is tanned using natural resources rather than chemicals. It is the vegetable tanning that gives these shoes their vibrant colors and the ability to wick away moisture. Most importantly, it allows the leather to mold to the shape of the foot for an incredibly comfortable fit. 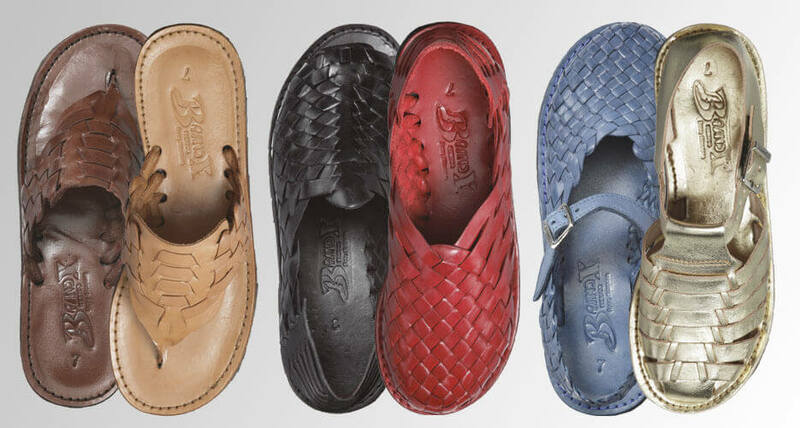 While Brand X can be found in many upscale boutiques and catalogs, the best way to get your hands—or in this case, your feet—on a pair is to visit the website at www.BrandXHuaraches.com, which displays the full array of bright colors and styles. Brand X Huaraches, 4228 Telegraph Ave., Oakland, 510-658-9006.